Secondary osteoporosis is caused by certain diseases and treatments that interfere with bone density and cause bone loss. Research from the Journal of Osteoporosis shows that secondary osteoporosis affects at least 21 percent of men and 17.5 percent of women. While there is no cure for secondary osteoporosis, various treatments can help with reducing bone loss, strengthening bones and preventing fractures. Back pain is common with osteoporosis of the spine. Pain is localized and increases with lifting. Tenderness in the affected area is also common. Pain and tenderness can persist for long periods. A number of medical conditions, medications, and lifestyle factors can cause secondary osteoporosis. Common medical disorders that contribute to secondary osteoporosis are cancers that cause bone loss including bone, breast, and prostate cancers, as well as hormonal imbalance conditions (such as hyperthyroidism, a condition that causes excessive thyroid function). Kidney or liver failure can also cause secondary osteoporosis, as can rheumatoid arthritis, a chronic autoimmune disease that causes severe inflammation of the joints, tissues and organs throughout the body. In addition, another cause is scurvy, a condition caused by severe vitamin C deficiency. Corticosteroids. These medications treat a variety of conditions and have been long known to cause bone loss. Lithium. Drugs with lithium are commonly used to treat bipolar disorder. Some lifestyle factors may also contribute to secondary osteoporosis, including excessive alcohol consumption, smoking, and not eating enough foods rich in vitamin D and calcium. Bone density testing. A bone densitometry (DEXA) test is the most accurate method for diagnosing osteoporosis. 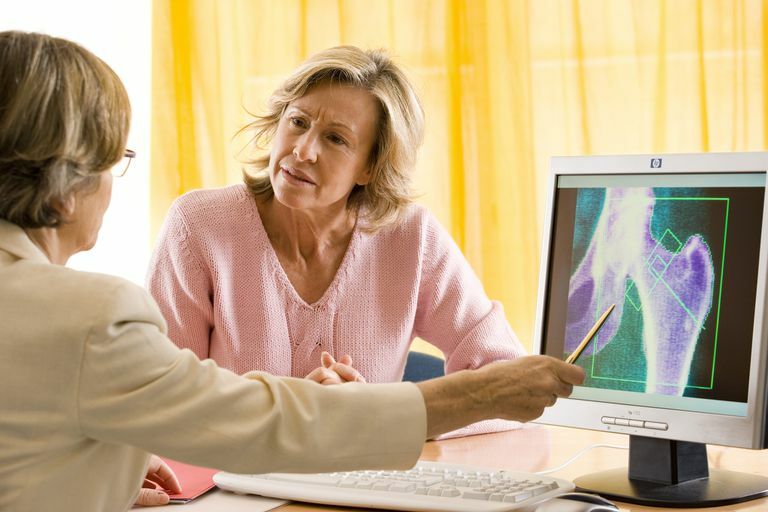 DEXA scanning uses low energy X-rays through a bone (spine, hip, or wrist) to indicate the severity of osteoporosis and the probability of fractures. The test is short, painless, and there is limited radiation exposure. Bloodwork. This is done to measure calcium, phosphorus, alkaline, and vitamin D levels. Abnormal and low levels may indicate osteoporosis. In men, testosterone serum testing may help with diagnosis. X-rays. X-rays are helpful with diagnosis when bone loss is significant. Much like primary osteoporosis, there is no cure for secondary osteoporosis. Treatment for secondary osteoporosis tends to be a little more complex and depends on the underlying condition. Treatment of secondary osteoporosis is also aimed at preventing bone loss, fractures, and disability as well as controlling pain. Your osteoporosis treatment plan will include lifestyle changes and medications. The following lifestyle changes can help you to manage osteoporosis and reduce your risk for fractures. Doctors recommend getting plenty of vitamin D and calcium from your diet. Calcium is the primary mineral in the bones while vitamin D helps the body absorb the calcium it needs for optimal health and strong bones. The combination of vitamin D and calcium can slow down bone loss. When bone loss is slowed, the risk for fractures is reduced. The NIH Osteoporosis and Related Bone Diseases - National Resource Center recommends adult men and women get 1,000 milligrams (mg) of calcium daily. Women between ages 51 and 70 and everyone over 70 should get 1,200 mg of calcium per daily. The NIH further recommends that adults under 70 get 600 international units (IU) of vitamin D daily. Vitamin D-rich foods include saltwater fish, fortified milk, liver, and egg yolks. If you cannot get enough vitamin D or calcium from your diet, your doctor can suggest supplements to help you get the recommended amounts. Physical activity, regardless of the type, may help to slow down bone loss and improve bone density. It can also improve posture and balance and reduce the risk of falling, which means it reduces the chance of more fractures. Strength training can help make your arms and spine stronger and can include anything from weight machines to resistance bands and free weights. Weight-bearing exercise such as walking, as well as low-impact aerobics such as biking can strengthen the bones in your hips, lower spine, and legs. In addition to all the health problems that smoking and overconsumption of alcohol can cause, they also affect your bone health. Cigarette smoking can interfere with calcium absorption and increase the risk of bone loss. Alcohol can have similar effects. You should avoid smoking altogether and drink in moderation. Prolia. Prolia (denosumab) is an alternative to bisphosphonates for people who cannot take these medications. Research shows it can improve bone mineral density and reduce fracture risk. Forteo. Forteo (teriparatide) injections are commonly prescribed to people who have had fractures and whose osteoporosis is caused by corticosteroid use. This medication may help rebuild bone. Hormone replacement therapy (HRT). HRT or estrogen has been shown to prevent bone loss and fractures and increase bone density. It is generally prescribed for women who are post-menopausal. It is available as a patch or a pill. HRT is not recommended for long-term treatment of osteoporosis due to its adverse effects, including increased risks for heart attack, strokes, blood clots, and breast cancer. Women should talk to their doctors about whether HRT is an option for treating their osteoporosis and whether the benefits of HRT would outweigh the risks. Osteoporosis is a common condition and while there isn’t a cure, treatments are available. Medications, hormone therapies, and lifestyle changes can help to slow done bone loss and make your bones stronger. If you think you may have secondary osteoporosis, talk to your doctor about the best treatments for your unique situation. With help from your doctor, you can find the right treatment plan and reduce your risk for fractures. American Society of Clinical Oncology. Osteoporosis. Updated October 2018. Jeremiah MP, Unwin BK, Casiano VE. Diagnosis and Management of Osteoporosis. Am Fam Physician. 2015 Aug 15;92(4):261-268. Miazgowski T, Kleerkoper M, Felsenberg D, et al. Secondary Osteoporosis: Endocrine and Metabolic Causes of Bone Mass Deterioration. J Osteoporos. 2012; 2012: 907214. DOI: 10.1155/2012/907214. National Osteoporosis Foundation. Diagnosis Information. NIH Osteoporosis and Related Bone Diseases ~ National Resource Center. Calcium and Vitamin D: Important at Every Age. Updated May 2015. Pines A, Sturdee, DW, Birkhauser MH. International Menopause Society – Updated Recommendations on Post-menopausal Hormone Therapy. European Endocrinology, 2007(2):85-86; DOI: 10.17925/EE.2007.00.02.85. Radiological Society of North America. Osteoporosis. Updated April 1, 2017. Sheu A and Diamond T. Secondary osteoporosis. Aust Prescr. 2016 Jun; 39(3): 85–87. DOI: 10.18773/austprescr.2016.038.